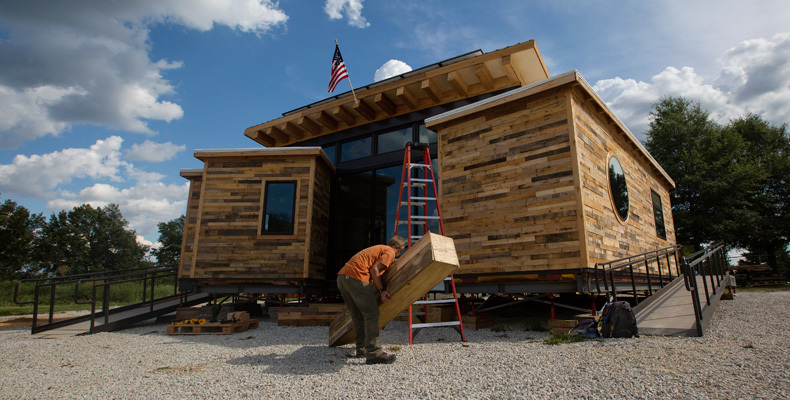 The Nest Home, the Solar House Design Team’s entry in the 2015 U.S. Department of Energy Solar Decathlon, receives its final touches before being shipped to Irvine, California, for the competition. It’s that time of season again. There’s a crispness in the air, pumpkin is in everything, and Missouri S&T’s Solar House Design Team is promoting sustainable living. The team just shipped its Nest Home, named for its nature-driven approach, to the U.S. Department of Energy Solar Decathlon in Irvine, California. And while team members may not build a new house every autumn, you can bet that at this time of year since 2001 they have either been preparing a house for the competition or devising plans for a future Solar Decathlon entry. Vote for the Nest Home to win the People’s Choice Award.